These are a the products that came in the gift sets I had received and posted about earlier (here). Here’s the first Gift Set containing a Fine Fragrance Mist and a Shower Gel (which I accidentally referred to as a Body Lotion in the earlier post, oops) both in the scent Dark Kiss. It’s no wonder Dark Kiss is such a fan favorite because these two smell absolutely mouthwatering-ly delicious! In the interest of full disclosure, the scent from the Fine Fragrance Mist doesn’t last as long as I’d like (which seems to be a common theme with all the Fine Fragrance Mist from Bath and Body Works). 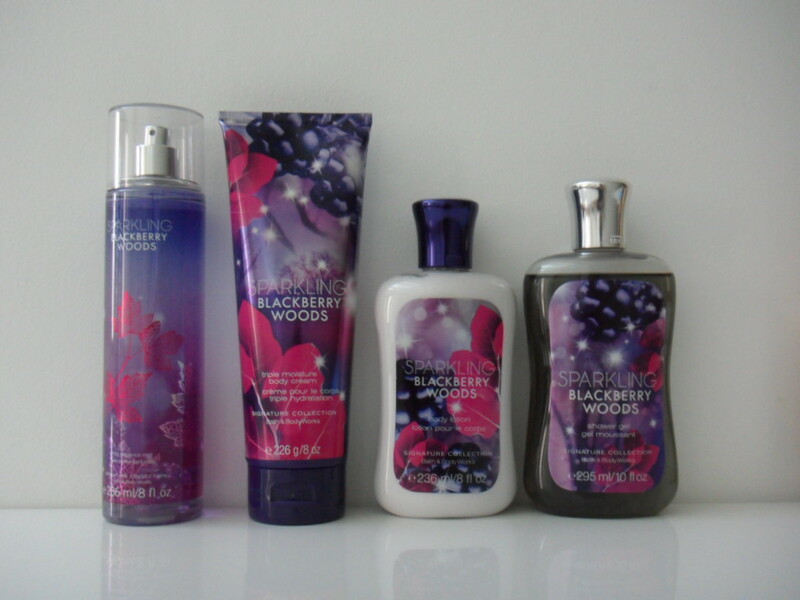 The Shower Gel on the other hand scents up my entire bathroom with it’s delightful berry scent every time I use it. Several of my readers have reached out to ask where they can find stuff from the Dark Kiss line because at the time it wasn’t available for purchase (in-store or online). This just goes to show that if it’s a fan favorite, Bath and Body Works will eventually re-release the scent, down the line (just like MAC cosmetics). If you are interested, here’s my earlier posts on Dark Kiss in candle form, mini-shower gel and mini-fragrance mist form, hand soap form, and wallflower refill form. 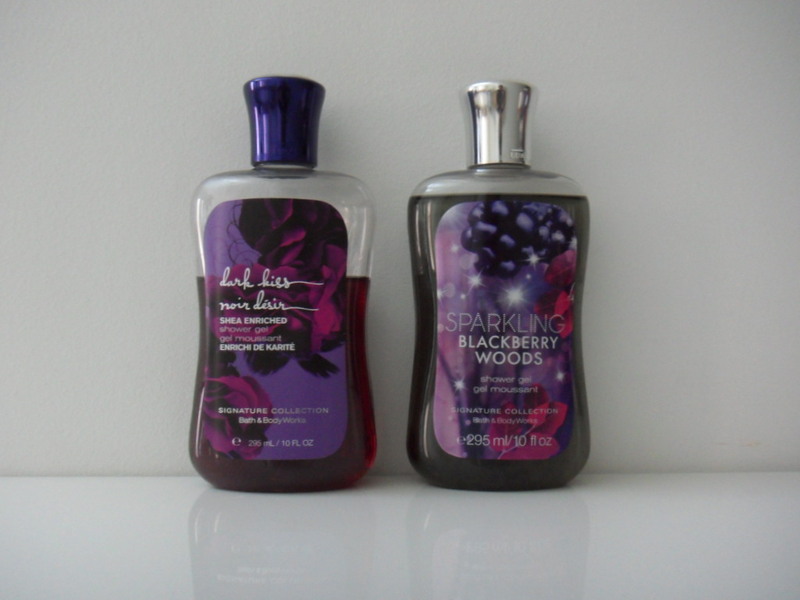 The next set came with a Body Lotion and another Fine Fragrance Mist, both in the scent Forever Red. I absolutely adore the festive packaging on both products (I mean how adorbs is that little red ribbon?) but quite frankly the scent seemed boring to me. Don’t get me wrong. It’s not bad. It’s just at this point, fruity floral scents from Bath and Body Works don’t excite me anymore, even if this did have a hint of spiciness to it. There was nothing that particualarly stood out to me about this scent. That said, due to the red theme, I think both of these would make a lovely addition to the rest of the red-themed scented toiletries (from this Body Shop haul) that are on display on the sinks (yes two sinks side by side, I wanna say it’s an “arab” thing) in the guest bathroom. Also included in the next set was yet another Fine Fragrance Mist, Triple Moisture Body Cream (I’ve discovered something about the packaging of these but more in that in another post), another Body Lotion, and another Shower Gel (initially this came with the indigo cap but I switched it with Dark Kiss because the cap on Dark Kiss was faulty) all in the scent Sparkling Blackberry Woods. Due to it’s name, I was expecting this to have to have a sweet yet masculine woods-y scent (sort of like Twilight Woods) but it yet another fruity floral scent *yawn*. I haven’t quite used all of the products so I don’t know how to feel about them yet. I love the color scheme on the Fine Fragrance Mist and I could definitely get some usage out of the Shower Gel but I’m not sure if I love the scent enough to actually hold on to any of them. So to recap, 3 Fine Fragrance Mists in Forever Red (guest bathroom), Dark Kiss (gorgeous scent), and Sparkling Blackberry Woods (appealing packaging) and all 3 have pretty poor sillage. 3 Body Moisturizers 2 of them being Body Lotions in the Forever Red (guest bathroom), and Sparkling BlackBerry Woods and a Triple Moisture Body Cream also in Sparkling Blackberry Woods. Finally, 2 Shower Gels (I switched their caps) in Dark Kiss (gorgeous scent) and Sparkling Blackberry Woods. Honestly, I feel overwhelmed having so many Bath and Body Works products that I’m “undecided” about so I’ve decided that if I’m not in love with the product I’m just going to give it away to someone else.